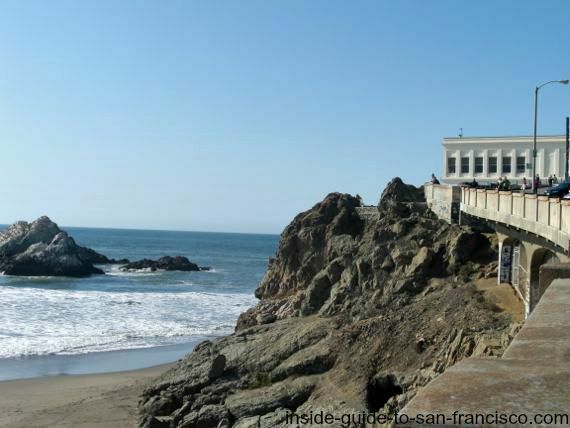 A restaurant has perched on this cliff overlooking the Pacific Ocean since 1863. 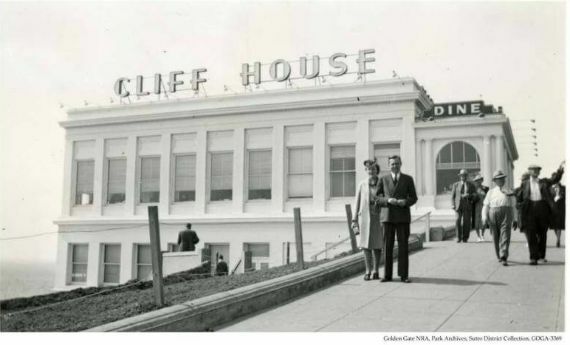 Generations of San Franciscans and countless visitors have dined at the Cliff House and enjoyed the gorgeous ocean views. There have been a whole series of Cliff Houses over the years, the style changing with the times. It burned down twice, and was closed during Prohibition, but the Cliff House is still here, and it's a wonderful place to come and have a meal and admire the view. The Cliff House sits at Point Lobos, right at the entrance to San Francisco Bay. This was a prime spot for shipwrecks before radar; strong currents, rocks and dense fog made for a lethal combination, especially at night. The SS Ohioan, a cargo ship, ended up on the rocks near the Cliff House on a dark night in 1936. There are three restaurants and two bars in the Cliff House. 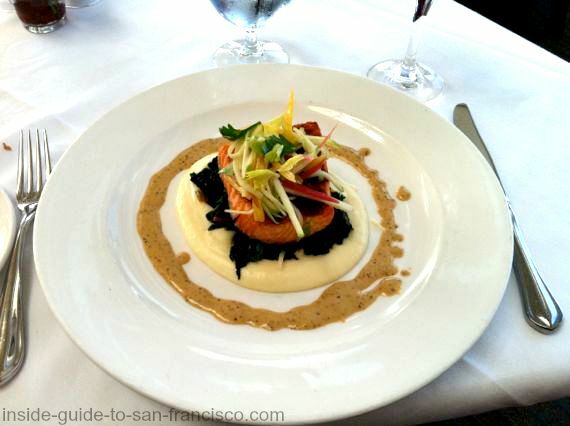 Sutro's: elegant-casual and somewhat expensive dining, with two stories of glass windows looking out over Seal Rock and the Pacific. Serene and beautiful. Open daily, 11:30 a.m. to 9:30 p.m., closed 3:30 to 5 p.m. 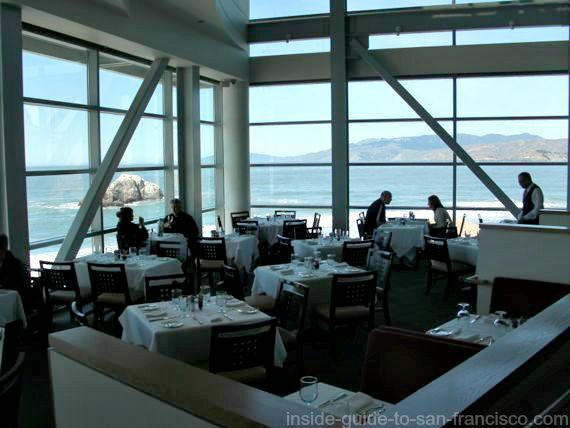 The Bistro: casual dining, less expensive, in the older part of the building, also with views. The Terrace Room: Sunday brunch buffet, delightful setting with live harp music and flowing champagne. Seatings at 10, 12 and 2 p.m., reservations recommended. Adults $55. 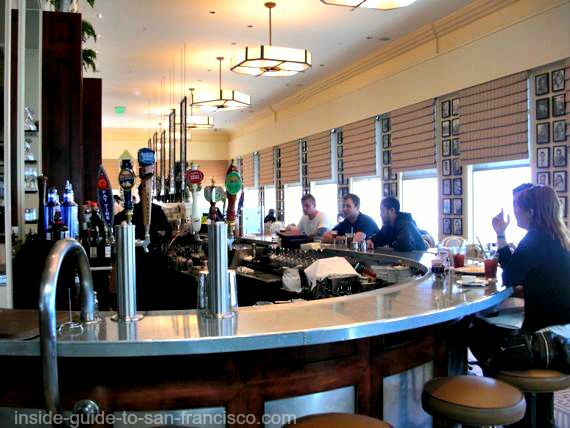 Also Sutro's Bar and the Zinc Bar, open till midnight Friday and Saturday. Live jazz Fridays, 7 to 11. 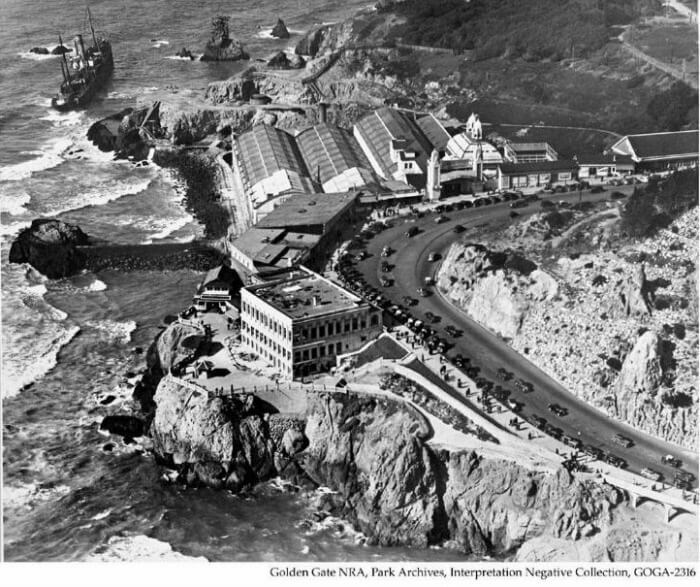 The first Cliff House was built in 1863 and became a place for the wealthy residents of SF to come out to the ocean in their carriages and dine. 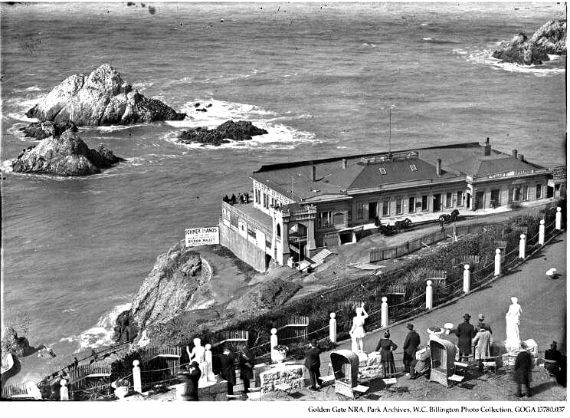 Adolph Sutro, creator of the Sutro Baths and Sutro Heights Park, bought the Cliff House in 1883 with the idea of pulling it out of a slump and making it family-friendly again. Apparently it had gotten a bad reputation for riffraff and scandalous behavior. 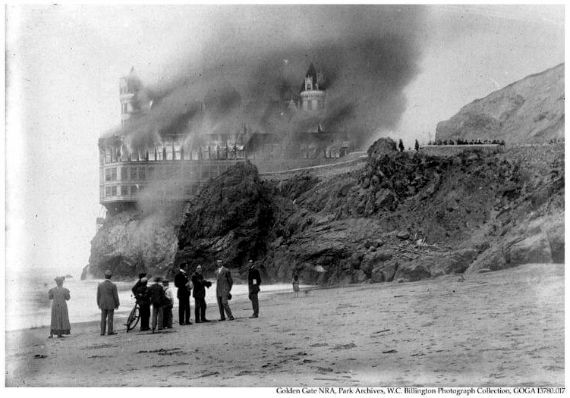 The Cliff House was badly damaged in 1887 when a ship carrying dynamite ran aground nearby and blew up. Sutro fixed up the building again, only to have it burn down in 1894. 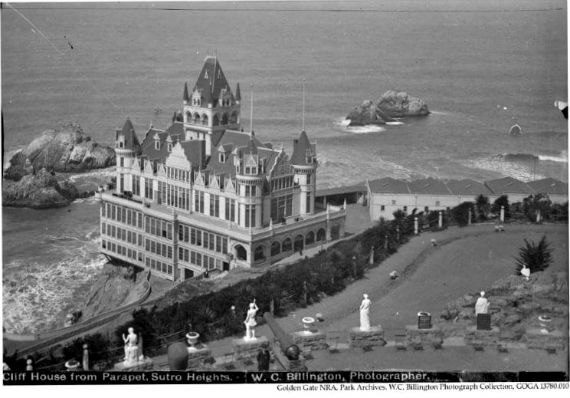 This time, Sutro carried out an elaborate construction plan and created a marvelous Victorian confection on the cliff, which included a ballroom, several restaurants, museums, etc. The Victorian Cliff House survived the 1906 San Francisco earthquake, but burned down a year later. An attractive neoclassical version was built, by Sutro again, in 1909, but it closed during Prohibition and didn't reopen until 1938 after another remodel. Two ugly remodels followed. 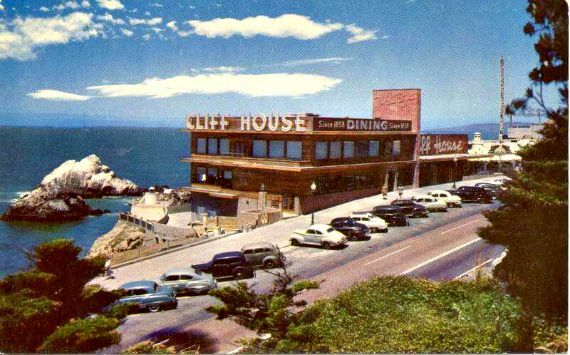 A brown, "modern" Cliff House appeared in 1950, then an even uglier blue and orange one in the 1970's. 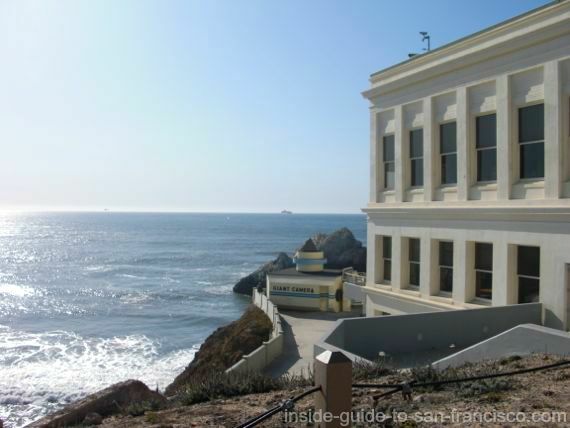 The current Cliff House was created in 2004: a reconstruction of the 1909 classical shape, with a modern wing added on. This time they got it right! It's an attractive building and the restaurants are very pleasant places to eat and enjoy the beautiful views. There used to be a large colony of seals on the large white rock just offshore, hence Seal Rock. The whole colony moved to Pier 39 after the 1989 earthquake, but some of them returned in 2007 and hang out there during the summer. This odd camera-shaped building sitting next to the Cliff House is a remnant of the amusement park that used to be just down the hill along Ocean Beach. The Camera Obscura, or "dark room", uses a series of lenses and a mirror to produce a live, 360 degree view of the surrounding area. The scientific principle was studied and sketched by Leonardo Da Vinci. Open 11:00 a.m. to 5:00 p.m. daily. Adults $3. The large collection of mechanical games that was here moved to Fisherman's Wharf in 2004. See Musee Mechanique. 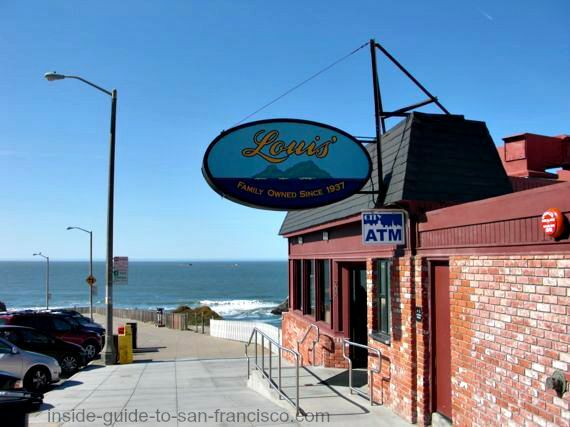 An alternative to the Cliff House is the classic American diner up the street: Louis' Restaurant, at 902 Point Lobos Avenue, next to the parking lot. 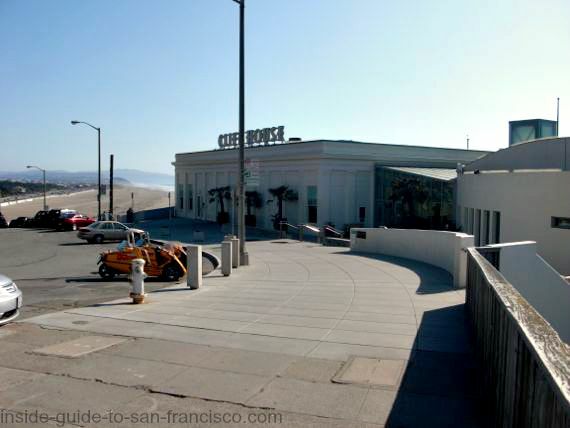 Great burgers and breakfasts, and a wonderful view of the Sutro Baths and entrance to SF Bay. Family owned since 1937, low key and friendly, and cheaper than the Cliff House. Cash only, but there's an ATM in the restaurant. Ruins of the largest indoor swimming place in the world. 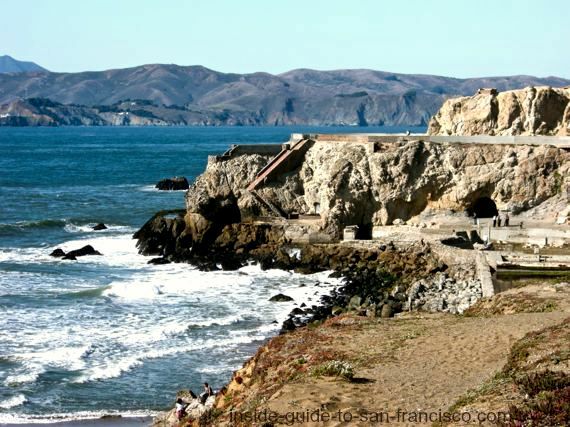 See Sutro Baths. 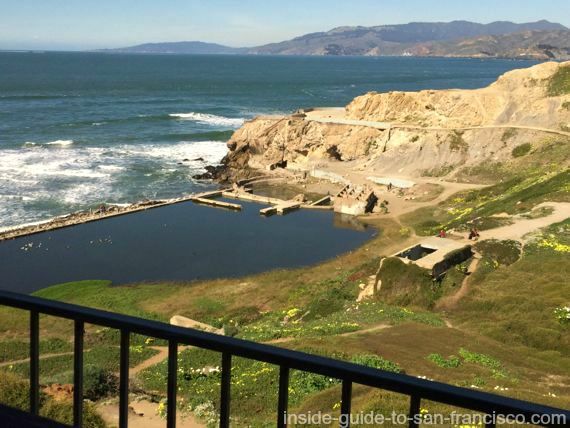 Adolph Sutro's gardens above the Cliff House, with amazing views of the coast. 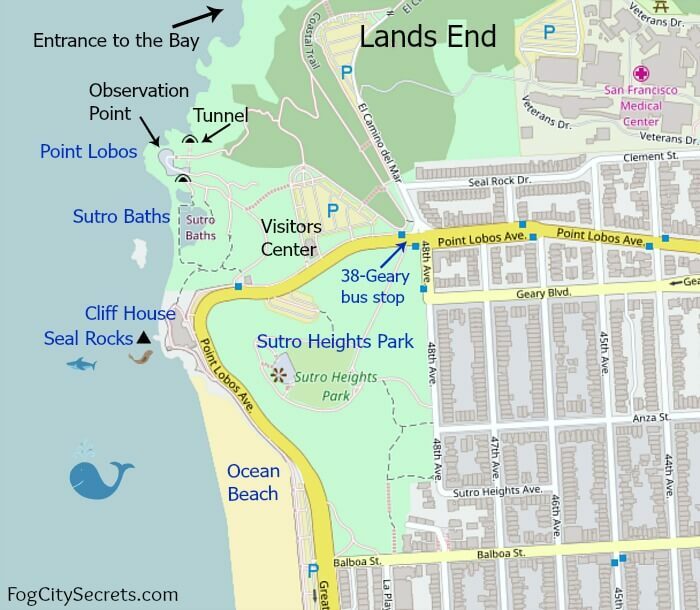 See Sutro Heights Park. 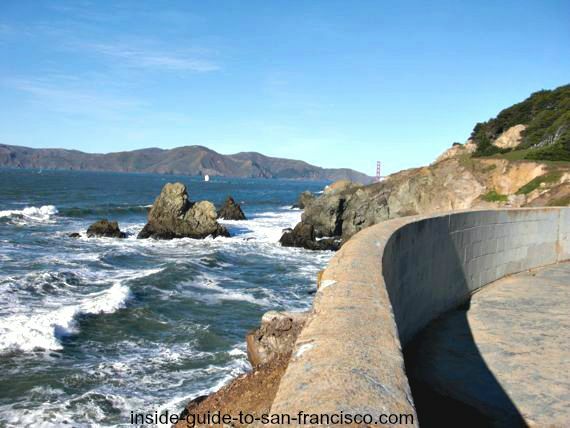 A wild and beautiful hiking trail from the Cliff House towards the Golden Gate. See Lands End Trail. The vast beach stretching along the entire western edge of San Francisco. Starts just below the Cliff House. See Ocean Beach. The Cliff House is at the end of Point Lobos Avenue, just below the parking lot for the Visitor's Center at Point Lobos and 48th Avenue. 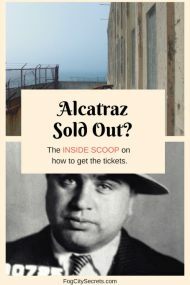 By Bus: The 38-Geary bus will takes you there; get off at the last stop on the route, Point Lobos Avenue and 48th Avenue, then walk downhill to the Cliff House. 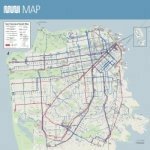 You can catch the bus downtown, on Market Street at First or Third Streets (a block from the Montgomery BART station), or right on Union Square on Geary Blvd. By Car: there is a large parking lot at Point Lobos and 48th Avenue, just uphill from the Cliff House. There are also parking spaces in front of the building and down the road, but they tend to fill up. Note: this area has been particularly hard-hit by the rash of car break-ins occurring in San Francisco recently. Best not to leave anything visible or valuable in your car when you park here.